Ford Motor Company Executive Chairman Bill Ford on the rollout of the company’s first aluminum F-150 pickup truck. Ford Motor Co.’s (NYSE:F) redesigned F-150 began rolling off the assembly line Tuesday, putting the aluminum-bodied pickup trucks on pace to hit showrooms in December. In an interview on FOX Business, Chief Executive Mark Fields said the nation’s No. 2 automaker by sales expects initial demand to be high. More than 225,000 people have submitted their contact information to receive updates about the 2015 F-150, according to Ford. More than 250,000 customers have built and priced their own F-150 online, the best early showing through 13 generations of the truck. Ford chose to construct the 2015 F-150’s body using aluminum, a lighter and pricier metal compared to steel. Aluminum is typically found on more expensive vehicles. The company has said the F-150’s aluminum alloy is a high-strength, military-grade material that offers advantages over steel, including weight reduction. As a result, fuel economy is expected to improve over the previous generation of F-150s. According to Fields, final numbers should be ready by the end of November. Fields said cheaper gas prices across the U.S. won’t dampen sales of the aluminum F-150, citing past surveys that show fuel efficiency is consistently a top priority for customers. According to AAA, the national average for a gallon of gas recently fell below $3 for the first time in four years. Executive Chairman Bill Ford agreed that it’s still “a great time” to seek cost-conscious truck buyers. “The number one reason people complain about pickups is fuel economy. It’s a work truck. Therefore, it’s a tool, and tools cost money. If we can reduce that for people, they’re going to love it,” he said. 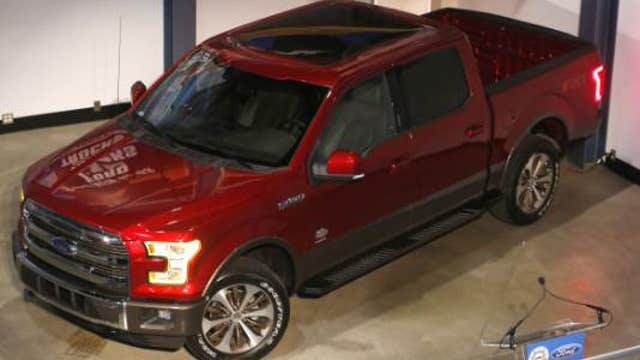 On Tuesday, the automaker marked the official start of F-150 production at Ford Rouge Center, where its Dearborn Truck Plant is located, in front of employees and media. The truck will be available in 90 markets next year. Through October, Ford has sold a combined total of 620,447 F-series trucks, which have logged 32 consecutive years as the best-selling vehicles in America. Shares rose 1.1% to $14.16 in recent trading.